Look for shelter. It can save your life. Surviving in the mountains tests all of your wilderness skills, including making fire, finding safe drinking water and coping with frigid temperatures. Resources dwindle and temperatures fall with increasing altitude, as do your odds of survival. 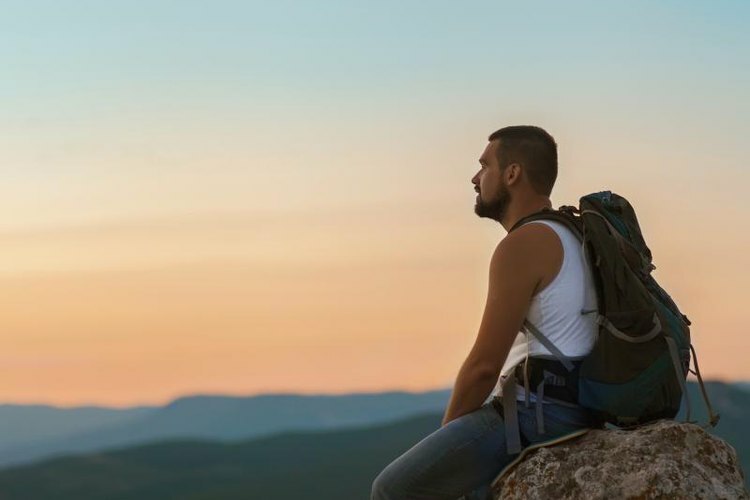 Mountainous regions are quite inhospitable for the unprepared, so it makes sense to carry an emergency survival kit when traveling in such regions. Once you realize you are lost or stranded, take stock of the situation. If you are only a mile or so from civilization, trekking out may be the best course of action. Conversely, if you find yourself miles from other humans, it is smart to stay put and make it easy for help to find you. Your altitude is an important factor in your decision making process – low altitude locations offer more resources and better weather than high altitude areas do. Depending on the circumstances, if may make sense to descend to a better location, and then stay put. The face of the slope is another important factor to consider; in the northern hemisphere, southern exposures receive more sunlight than northern exposures do. While waiting for help to arrive, construct a shelter to shield you from wind, precipitation and cold temperatures. Look for a sheltered location, but with good visibility to help spot search planes or vehicles. Place large branches diagonally against a fallen tree and cover them with many layers of smaller sticks, pine boughs and vegetation. You can also dig a trench and cover the top with branches. In snow-covered habitats, a snow cave makes a great shelter, but place at least two ventilation holes in the sides and top. Clear a space and make a rock-lined fire circle. Use as many rocks as is feasible, because they will absorb and radiate the heat of the fire. Collect plenty of firewood and store it nearby so that you do not run the risk of running out of fuel. If you are over the timberline, you must descend far enough to find enough wood for your fire. Use a magnesium fire starting kit, concentrated sun light, or – if you have them – matches, to start the fire. Additionally, keep a few evergreen branches on hand. If you see a search party, place them on the fire to create thick smoke. Streams are often common in mountainous areas, but you must boil the water for three to five minutes to kill any pathogens. Snow and ice are also water sources, but you must melt and boil frozen water sources before drinking them. If you don't have fire, collect dew with a cloth or place a plastic bag around the living leaves of a tree, which will collect water as it escapes the leaves. You can drink water from these sources without treating it. Take care to avoid dehydrating yourself – an often-overlooked consideration in cold-climate survival situations – by drinking at least 3 to 6 quarts of water per day.